I remember Grammie Dickson in the late 1940s stirring, stirring, stirring the contents of her dented aluminum pot on her kerosene stove, adjusting the flame occasionally, and stirring, stirring, stirring. She was making yellow tomato preserves. When she declared the preserves done, she’d ladle the golden liquid into assorted “jelly glasses” she was recycling, and cover the tops of the hot preserves with shaved paraffin, which melted from the heat of the preserves and sealed them for later use. In the 1950s I remember my mother making yellow tomato preserves. She explained the unwritten recipe for this edible family heirloom: equal measures of yellow tomatoes and sugar plus fresh lemon. Mother shortened the cooking time and added pectin, but, she never thought her preserves quite measured up to Grammie’s. About 15 years ago I started growing Yellow Pear tomatoes and began trying to duplicate Grammie’s preserves. I cooked the tomatoes with skins on, my theory being that the skins contained pectin that helped gel Grammie’s preserves, but mine remained too thin. Over the years I experimented, adding pectin, cooking the tomatoes longer, running the mixture through a food mill, and blanching and skinning the tomatoes. But my preserves never measured up to Grammie’s—until this year, that is, thanks to the Internet. One night I searched on the Internet for “yellow tomato preserves recipe.” Suddenly I was confronted with pages of recipes, most not resembling what I sought. But one, at cooks.com seemed similar to our family’s recipe. 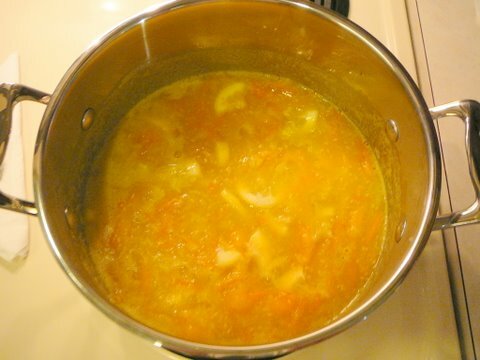 It called for five pounds of yellow tomatoes, five pounds of sugar, two thinly sliced lemons, all simmered for three hours, stirring every 15 minutes. Three hours? I had thought one hour was more than enough. 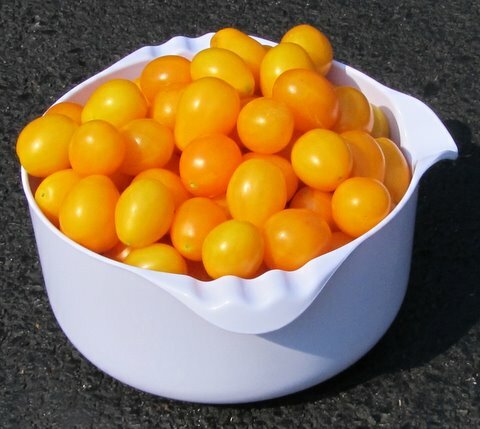 So in the garden I picked five pounds of Yellow Plum tomatoes, blanched, skinned, and quartered them, tossed them into a stainless steel pot, added five pounds of sugar and a huge thin-sliced lemon, and simmered the mix for three hours, stirring every quarter hour—stirring, stirring, stirring. After three hours, the mixture had melded into a deep golden color with slight citrus fragrance. But on the final stir, I thought the preserves still too thin. Should I trust the recipe—and bottle and process the preserves in the hot canning bath—and hope the liquid would gel over the next few days or weeks? Or should I add some pectin? I consulted an information sheet from a pectin box, figured out an approximate amount, and added two packets. As I continued stirring the simmering gold, I could feel the mixture begin to thicken. I knew I had made the right decision. I ladled the preserves into seven eight-ounce and six four-ounce jars, processed them in the canning bath, and listened happily as they cooled on the kitchen counter and their clicks announced proper sealing. I could have canned another two jars, but a laborer deserves pay for his work, don’t you think? I filled two Pyrex bowls and put them into the fridge after they cooled, but not before taking a knife and covering a Wheat Thin, or was it ten, with thick yellow tomato preserves—just like Grammie used to make. What made the difference this year? I don’t think it was our electric stove or our stainless steel pot. Proportions of ingredients were about the same, but maybe measuring by weight instead of volume was important. I think using Yellow Plum, rather than Yellow Pear, tomatoes was a plus because the plums have more substance. I think the pectin ensured that my preserves were firm, but not so firm as to require hammer and chisel for serving. Perhaps the biggest difference was the three-hour cooking time, which truly melded the tomatoes, lemon, and sugar into our family’s edible heirloom. As the jars of golden preserves a day later sat on our kitchen counter, I paused to enjoy the sight. They represent four hours of work—not counting growing the tomatoes and or the time I’ll spend scouring the stovetop. Friends and we will enjoy the jars of gold through the coming winter. I’ll not hesitate to recommend the perfect combination: a buttered, toasted English muffin topped with a spoonful of yellow tomato preserves. Each bite will duplicate in the 21st Century what our great-grandparents, grandparents, and parents experienced in the 19th and 20th Centuries. From mouth-watering treat to family history, there’s gold in my jars of yellow tomato preserves. I can attest that this recipe is da-bomb! Thank you, Bob, for sharing not just Grammie's recipe but the actual finished product with your friends at HGIC! It brought a ray of sunshine to this rainy day! You're welcome, Ria. And thank you for the tip that saved me an hour processing tomato sauce last night! Thanks Bob,great description. Living just down the road from Grammie, I'd find every occassion possible to do some errand there, when I'd always be rewarded with a piece of toast covered with that wonderful golden jam. Had no idea the recipe was still around. Thanks Bob – I was too young to remember Grammie Dickson's preserves, but I am going to tuck this one away and give it a try. One more reason to get more serious about gardening, as yellow plum tomatoes aren't so easy to come by in the stores! Tanley Dickson-Lemon from Bend, Oregon…. Thank you Bob for sharing this wonderful piece of family history. I don't honestly know if I ever tasted the tomato preserves or not but a treasure to know about non-the-less. Good article. Great picture. Thanks for sharing. Nice! Next year I'm going to plant some yellow tomatoes and give your Grammie's recipe a try! 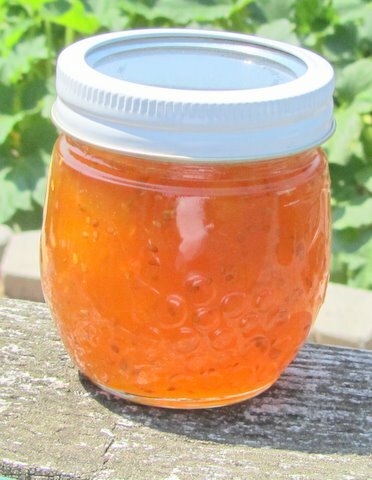 Looks like 2011 will be a great year for growing yellow tomatoes–and making preserves. Right on! Hello, Goodwyn! What a delight to hear from a young gardener and relative on the West Coast. I hope the recipe works for you. You have enough tomatoes to make two batches–which is a lot of preserves! Please take some photos of you and your crew at work and of the finished product! Uncle Tractor. Hey Bob, this sounds like exactly what I remember from my mother's kitchen. Did you use regular pectin or low/no sugar? How long before the end did you add the two packets?